It's nearly the end of the road, but that doesn't mean Russell can't throw another hissy fit. His latest fit is that Sandra was dumb to play the hidden immunity idol when it wasn't needed, but more importantly, it was dumb that she didn't tell him she had it. That's right: the guy who had never told Sandra in this game he ever had idols demands Sandra tell him. Eat shizz, Russell. Parvati, who has increasingly become a bigger threat, wins immunity which helps the Villains keep their plan of voting off Colby. Colby makes another surrender speech, which he famously did earlier in the season against James, but pleads that Russell consider his options and keep Colby in the game. No such luck and at long last, the entire Hero tribe is eliminated from the game. It's go-time on operation get-rid-of-Parvati, but first we must endure the stupid montage of remembering all the eliminated survivors. Faaast forward! The final immunity challenge is a to collect various necklaces and escape a giant maze... blindfolded! I did a corn maze this past fall, walked around for an hour with my eyes totally open, and finally escaped the maze through the entrance so this must be hellish. It's all so close and I'm yelling, "Anyone but Russell!" Jerri, Parvati, and Russell all escape the maze at the same time and are so close to grabbing the immunity necklace, but the troll grabs it. Ugh. Russell is guaranteed to be at the final Tribal Council for $1 million. Sandra and Russell convene and he guarantees he won't vote her out because he is 100% sure he will beat her for the prize. What a douche. Sandra says she's fine with 2nd place, but she knows she still has a chance. So the choice is Jerri or Parvati, with the obvious choice to vote out Parvati who has won challenges, befriended the jury, and has been crazy strategic. Russell also sees the benefit of voting off Jerri because he's totally sure that if Jerri's in the jury she'd vote for him to win. At Tribal Council, Parvati's argument to keep her in the game is her loyalty to Russell, citing how they've protected each other the whole game. Russell disagrees and claims he's the only one who's done the protecting. This man enrages me. Anyway, the votes come out of the jug and it's Jerri who has been sent to the jury. Aw, Jerri. I had such high hopes for you. But I'll say you might not have won the $1 million, but you've won over a lot of fans. Awwww. The next morning, the Final 3 share the final day brunch feast and then Sandra burns Russell's hat in the fire when he leaves so everyone can see his bald spot (luckily, we are saved by his buff covering his head). Jeff brings in the jury and asks for opening statements. 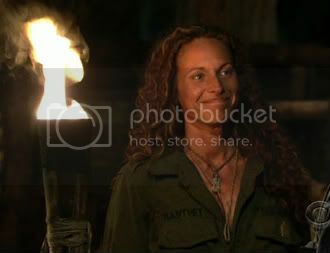 Sandra argues that she got through this game without a true solid alliance, and that she tried many times to eliminate Russell but the Heroes would never bite. Russell's statement is full of BS and is unapologetic about the way he played and believes he deserves to win. Parvati explains that she was a target from day 1 and had to fight every day to survive. 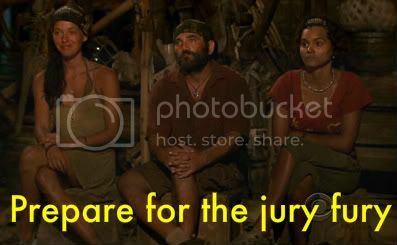 It's so obvious that the jury is casting 0 votes in Russell's direction, citing his horrible behavior and lack of remorse. Parvati is praised for her strength, some key strategic moves, and for doing whatever it took to make it to the end. Rupert apologizes for turning a deaf ear to Sandra when she approached him for strategic reasons, and is able to defend her "coat-tailing" strategy. 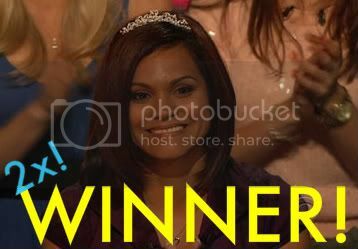 I think Candice's speech when voting for Sandra summed up why Sandra won: she blurred the line between villain and hero. I definitely respect Sandra's game and her strategy, vote for anyone but me, led her to victory twice now, the 1st 2-time winner of Survivor ever. I won't say I 100% wanted Sandra to win (personally, I think Parvati played a spectacular game), but I'm glad it was anyone but Russell. He needed to be taken down a peg... again. Speaking of Russell, he won't STFU at the reunion. He belittles Sandra (who isn't taking his crap), claims America should have a say in the final vote, and says he's the best Survivor since he made JT look like a loser and that America likes him. Jeff keeps saying fans are calling this the best season ever, but I disagree. 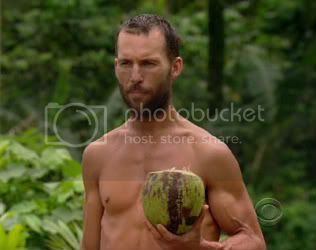 For me, Russell hindered much of my enjoyment of the season towards the end, hogging all the air time, relying mostly on immunity idols for survival, and being a nasty person. But that's me because the viewing public voted Russell the player of the season. 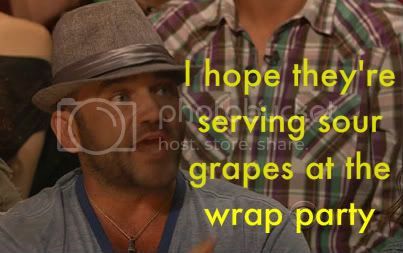 Anyways, Russell hogs the 1st half hour of the reunion, while we get to hear from other castoffs. JT's letter/immunity idol handoff is voted the worst move in Survivor history, and I think James' likability factor is blinding them from his stupidity. He had TWO idols and got voted off! 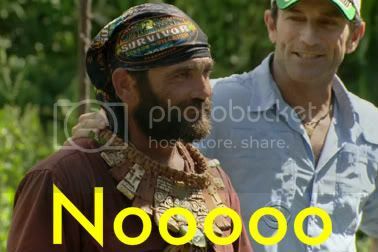 Overall, it's a usual reunion with nothing that awesome but Probst officially announced that the next season will be in Nicaragua. See you in the fall Survivor fans!